We will attend the 14th International Conference "Underground Construction Prague 2019”, which will be held in Prague, June 3 – 5, 2019. Come and visit our booth. AD Softwares Tecnicos, our partner in Brasil, will attend the 9th Seminar on special foundations and geotechnical engineering - SEFE 9. The event will be held from June 4 to 6, 2019, in São Paulo. Come and visit our booth no 33. JSC Reconstruktsiya, our partner in Russia, will present the GEO5 software at the international exhibition "GeoInfo EXPO - 2019". The event will be held at the Sokolniki Exhibition and Convention Center in Moscow (6 - 7 June 2019). Itech, our partner in France, will present GEO5 software at the SolScope 2019 in Marseille at Parc Chanot on June 26th and 27th, 2019. Itech, our partner in France, will attend the "Batimat" exhibition in Paris from 4th to 8th November, 2019. 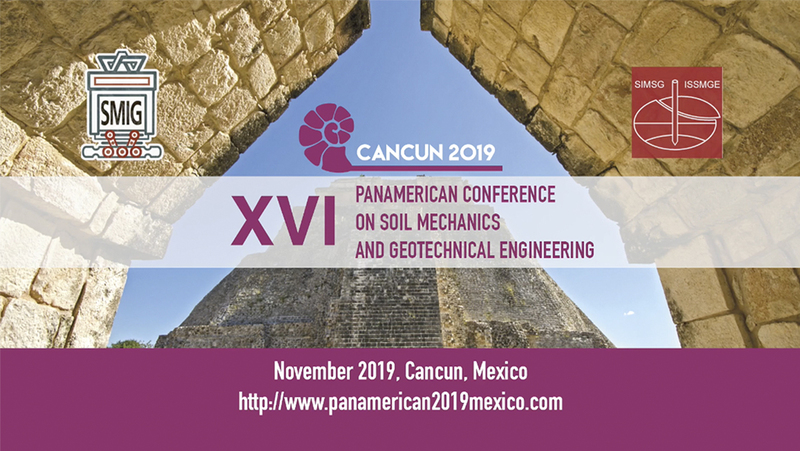 Fine will attend the XVI Panamerican Conference on Soil Mechanics and Geotechnical Engineering in Cancún from 17th to 20th November 2019. Our partner Balidinistudio will present GEO5 at the Expokos Fair in form of a seminar. The international fair will be held at the Palace of Youth, Prishtina (16 - 18 April, 2019). Oitec Ltda., our partner in Chile, will be attending the XII Chilean Conference on Seismology and Earthquake Engineering. The event will be held on April 03 to 05 2019 at the Isla Teja Campus of the Universidad Austral de Chile, in the city of Valdivia. We support International Academic Competition - The Hall of the Year organised by Faculty of Civil Engineering, CTU in Prague. Students, do you like challenges? The task of this year competition is to design and fabricate a model of a salt storage yard roofing with a conveyor. Hurry up, the deadline for registration is the 4th of April! JSC Reconstruktsiya, our partner in Russia, will present the GEO5 software at the international exhibition "MosBuild 2019". The event will be held at the Crocus Expo in Moscow (2 - 5 April 2019). 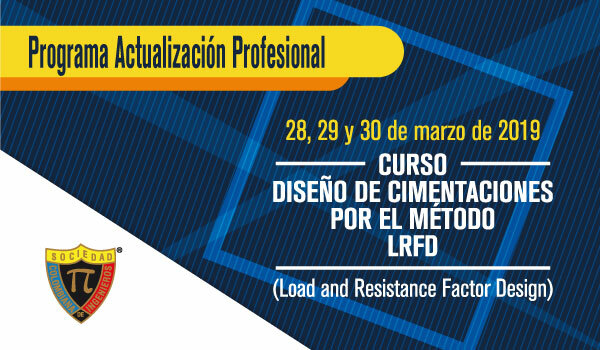 ICC Colombia will be delivering a training course on foundations design by using the LRFD method in Bogota (28-30 March 2019). Instructor: Ing. Tomáš Janda, Ph.D.
We will concentrate mainly on the modelling aspects FEM and less on the user interface. Users without previous hands-on experience with the program are encouraged to go through the demo models. Sharing your questions or insights about concrete FEM models is highly appreciated and encouraged. This workshop is for free, but can only accept limited amount of attendees – don´t wait to register (mail to: johana.baborova@fine.cz). Our partner Baldinistudio will present GEO5 software at 23th International Construction Fair in form of a seminar. 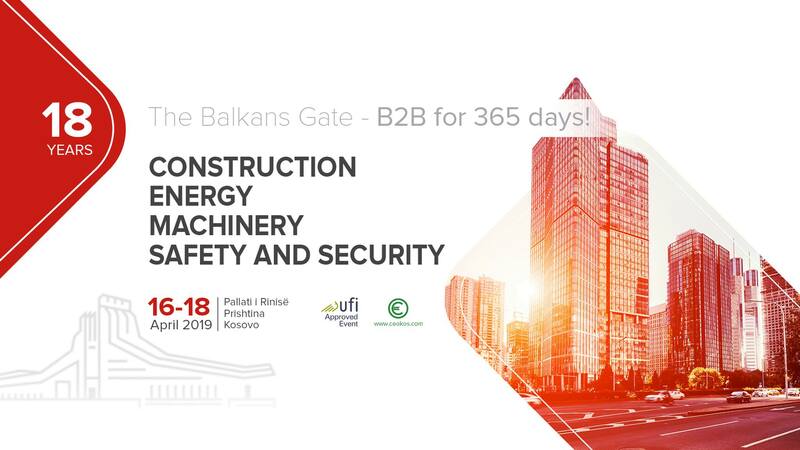 The fair is organized from 13th to 16th March 2019 in Banja Luka, Bosnia. JSC Reconstruktsiya, our partner in Russia, will attend the international conference on geotechnics "Fundamentals and Applications in Construction (GFAC 2019)" hosted by Saint Petersburg State University of Architecture and Civil Engineering from 6th to 8th February 2019. Oitec Ltda., our partner in Chile, will be attending “X Chilean Congress in Geotechnical Engineering” in Valparaiso, Chile (3rd - 5th December 2018). 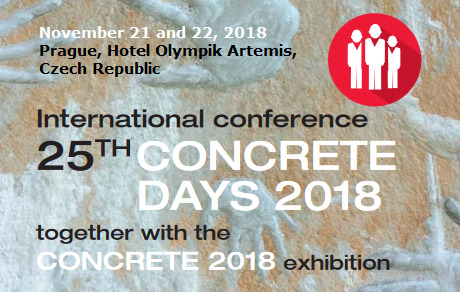 Fine company will be attending the "25th Concrete Days 2018" conference in Prague from 21st to 22nd November. Come and visit our booth. 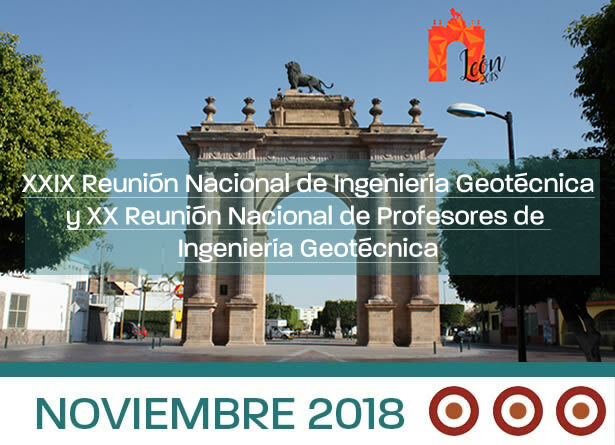 Fine will attend the XXIX Geotechnical Engineering Conference (XXIX Reunión Nacional de Ingeniería Geotécnica) in León, Guanajuato from 21st to 24th November. Fine company will support the 46th Foundation Engineering Conference as the main sponsor and present the new GEO5 2019 Edition. The conference will be held in Brno (Czech Republic) from 19th to 20th November 2018. Come and visit our booth. Finesoftware.eu is the winner in the IT section. A total of 206 projects were submitted to the 17th year of the WebTop100 competition. The organizers evaluated and received feedback from 60 experts in individual areas of digital marketing. Our website was created by the Fine internal team of great developers in a close cooperation with Giant company. The website received the best rating in, among others, the User Experience section, e-shop and product information. All is supplemented with a multi-language websites, number of training and engineering materials and free demo downloads. ICC Colombia, our dealer in Colombia, will attend the "XVI Congreso Colombiano de Geotecnia” in Paipa, Colombia. Feel free to visit their booth no.6 to find out more about improvements in GEO5 software. 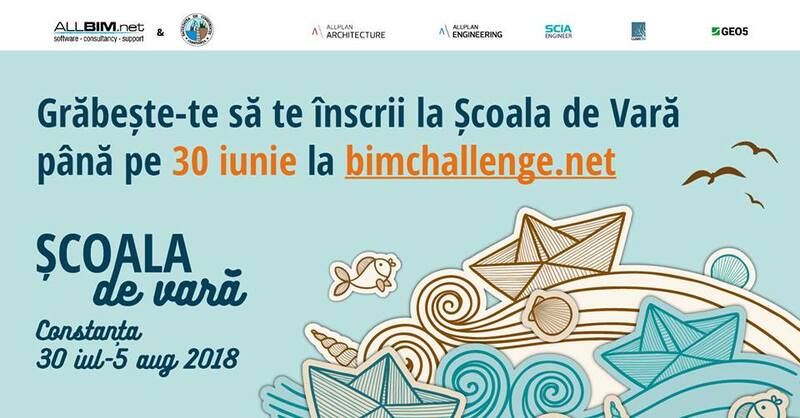 Allbim, our partner in Romania, will attend the international conference "Architecture, Technology and the City" at the Technical University of Cluj-Napoca from 25th to 26th October 2018. Allbim, our partner in Romania, will attend the "53rd National AIIR Conference" in Sinaia from 17th to 19th October 2018. Gintegro, our US distributor, conducted three-day GEO5 training at the Ministry of Transportation in St Vincent and Grenadines. GEOgrup Insaat, our partner in Turkey, will be attending the "Road to Tunnel Expo 2018" on 3-6 October 2018 in Istanbul. GEOgrup Insaat, our partner in Turkey, will be attending the "17th National Conference on Soil Mechanics and Geotechnical Engineering" on 26-28 September 2018 in Istanbul which is organized by Turkish Society for ISSMGE. Due to demand, Infrasys has scheduled additional 1 day introductory training courses for GEO5 Geotechnical Analysis and Design software at Infrasys Training Center, Pasig City in August and September, 2018. Our partner ALLBIM NET (Romania) together with the Ovidius University of Constanta organise the Summer School - the week of intensive training for students who want to improve their knowledge of GEO5 and other structural engineering software (Allplan, SCIA Engineer). Allbim, our partner in Romania, will present GEO5 as a part of solutions for hydro structures during the 4th International Conference "Water Across Time in Engineering Research - WATER 2018". The conference will be held at the Ovidius University of Constanta in Romania (June 21-23, 2018). 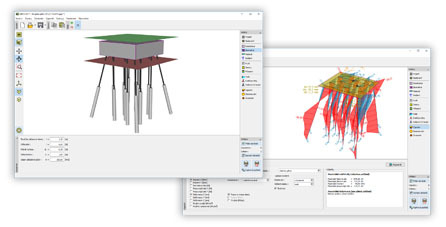 3DR Engineering Software Ltd., Ltd., our dealer in Greece, will be attedning the 16th European Conference on Earthquake Engineering in Thessaloniki, Greece (18-21 June). 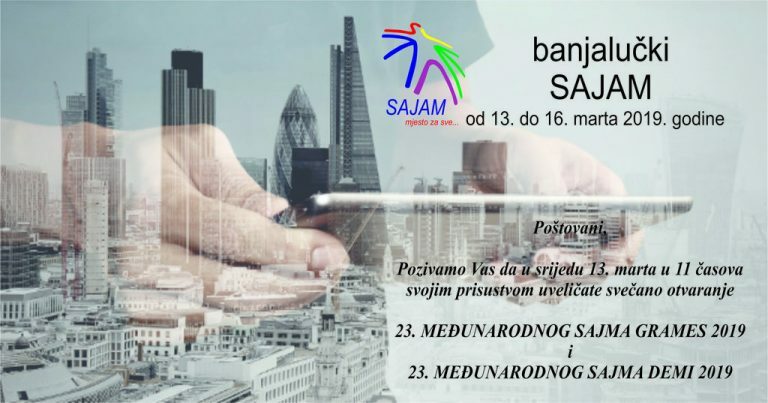 Geoportal and Baldinistudio, our partners in Croatia, will be attending the Annual Meeting of Croatian Chamber of Civil Engineers (13. Dani ovlaštenih inženjera građevinarstva) in Opatija from 14th to 16th of June 2018. Stop by their booth and get information about latest Edition of GEO5 geotechnical software. Itech, our partner in France, will present GEO5 software at the JNGG 2018 (French geotechnical congress), in Marne la Vallée, France. Fine and our dealer in Portugal will attend the geotechnical congress "16CNG - 16º Congresso Nacional de Geotecnia" in Ponta Delgada this May from 27th to 30th. 5th Fine Dealer´s Meeting took place on May 17-18, 2018 in Prague. Over 30 participants from 25 companies worldwide gathered in the Hotel Pyramida for two intense working days. The meeting featured selected talks from geotechnical engineers and developers from Fine company. All in all, the meeting was a success not only because it brought together all the partners, but also it was an opportunity to share experiences and shows the growing potential of GEO5 software. Take a look at more photos on our Facebook page. Allbim, our partner in Romania, will attend the "XXVIII. National AICPS Conference" in Cluj-Napoca from 14th to 15th May 2018. 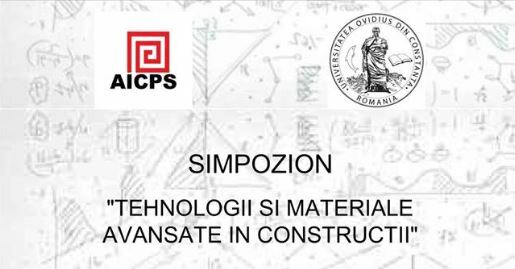 Allbim, our partner in Romania, is attending the "Symposium of Technologies and Advanced Building Materials" at the Ovidius University in Constanta from 10th to 11th May 2018. Our dealer in Indonesia, GTL Geotech Services, conducted the short course for using GEO5 program Pile Group. ICC Colombia, our dealer in Colombia, will attend the conference "Jornadas Geotécnicas y Estructurales" in Bogotá this April 12th and 13th. April 4-5, the University of Transport will host the XV International Scientific and Technical Conference "Modern Problems of Design, Construction and Operation of the Railway Track" dedicated to the memory of Professor Georgy Shakhunyants.On April 5, the technical support specialist Bulatov Dinar will tell you how to use software for designing in difficult conditions with the example of the Gabion Wall module. On March 30, the conference "Young Science" will be held at the Federal State Institution of Education "Russian University of Transport". Representative of the company "Reconstruction" Dyatlova Kseniya will tell the report about the module "Stratigraphy" within the framework of this conference. Cooperation with University has been ongoing since 2010. We take part in university conferences, including in the Shahunyants' Readings. Fine and Infrasys, our partner in Philippines, organized training of GEO5 2018 for DPWH at Head office in Manila from 5 to 9 March 2018. JSC Reconstruktsiya presented GEO5 in the XI All-Russian conference "Actual problems of designing roads and artificial structures" in St. Petersburg during 15th and 16th February 2018. ICC Chile will be delivering online webinar on Deep and Shallow Foundations Design this January 20th from 11am (GMT-5). Our partner "JSC Reconstruktsiya" (Russia) will hold the last webinar on "Practical examples". It shows the work with the software GEO5 (Slope Stability, Settlement and MSE Wall). The webinar will be held on 20th December from 10:00 to 11:30 (Moscow time). 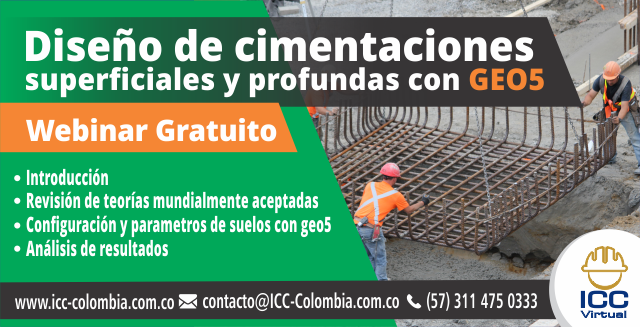 ICC Colombia will be delivering free online webinar in Spanish language "Introduction to shallow and deep foundations using GEO5" this November 27th from 7pm (GMT-5). JSC Reconstruktsiya, our partner in Russia, will be attending the conference "Design of transport infrastructure" from 22nd to 24th November 2017 in St. Petersburg. One of the presenters will be Vladimir Kogan (CEO, JSC Reconstruktsiya). Fine company will be attending the "24th Concrete Days 2017" conference in Litomysl from 22nd to 23rd November. Come and visit our booth. GEOgrup Insaat, our partner in Turkey, will be attending the “7th Geotechnical Symposium” in Istanbul from 22nd to 24th November. Fine and Infrasys, our partner in Philippines, presented GEO5 Geotechnical Solutions to the DPWH Regional Office XIII in Butuan City. Fine company supported the 45th Foundation Engineering Conference in Brno, Czech Republic (13-14 November 2017) as the main sponsor. Also the winners of the sixth edition of the Student Competition, which is organized together with Mott MacDonald company, were revealed. The winner of the competition in the category of "diploma thesis" is Ing. Gabriela Hůlková (ČVUT Praha) for his work "Tunnel face stability during shield tunelling in soft ground with drained and undrained behaviour". The winner of the competition in the category of "bachelor's thesis" is Bc. Katarína Sobolová (VŠB-TUO) for his work "Combined Construction of Portal Section of Tunnels". Fine company will support the 45th Foundation Engineering Conference in Brno, Czech Republic (13-14 November 2017) as the main sponsor. Also the winners of the eleventh edition of the Student Competition, which is organized together with Mott MacDonald company, will be revealed. infraSys, our partner in Philippines, is organizing a half-day seminar on foundation design using GEO5 software in Manila (10th November 2017). The presenter will be Jiri Laurin (CEO, Fine Ltd.). Fine will be attending the 5th edition of GEC Geotechnics expo & congress. The event will be held at the Exhibition Center Offenburg in Germany (25th - 26th October 2017). Visit our booth no. 34. ICC Colombia will be delivering a training course on Deep and Shallow Foundations Design in Bogota (20-22 October 2017). ICC Chile will be delivering a training course on Retaining Wall Design in Santiago (20-22 October 2017). GEOgrup Insaat, our partner in Turkey, will be attending the “The Third International Soil-Structure Interaction Symposium” in Izmir from October 18 to 20, 2017. K DMAC Technology, our partner in Malaysia, will be attending the "2-Days Seminar on Geotechnical Engineering" in Alor Gajah (16th and 17th October 2017). Start Consult GmbH, our partner in Austria, will be attending the 66. Geomechanik Kolloquium in Salzburg from 12th to 13th October 2017. JSC Reconstruktsiya, our partner in Russia, is attending the "International specialized exhibition-forum ROADEXPO" in Moscow (10th - 13th October 2017). Intelligent BIM Solutions will introduce GEO5 software together with other products in Tallin on 28th September 2017. Start Consult GmbH, our partner in Germany, will be attending the annual symposium 13. Fachtagung Konstruktiver Ingenieurbau in Berlin 28th September 2017. Fine and Start Consult GmbH, our partner in Germany, will be attending the geotechnical conference Fachsektionstage Geotechnik in Würzburg from 6th to 8th September 2017. Fine company will be sponsoring the conference "XV. 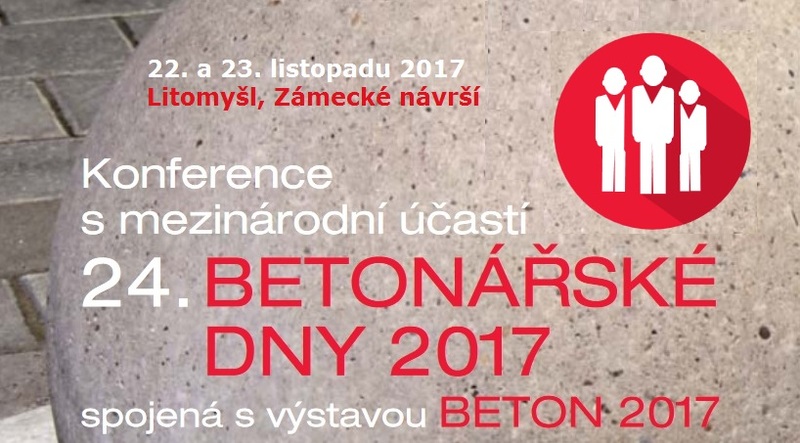 hydrogeologický kongres" in Brno, Czech Republic (4 - 7 September 2017). Fine will be attending the conference "Seminario Carreteras de Montaña" in San José this September 4th and 5th. ICC Colombia will be delivering a training course on deep and shallow foundation design in Quito (from 31/08/2017 to 2/09/2017). Prof. Ing. Edinson Guanchez and Prof. Heriberto Echezuria (Sísmica Adiestramiento) are organizing the online course "Geotechnical and Structural Design of Deep Foundations". The course will last from August 14 until September 25, 2017. Prof. Ing. 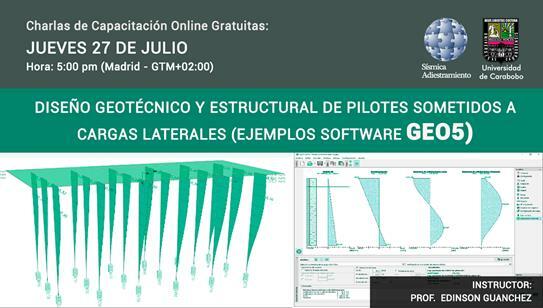 Edinson Guanchez (Sísmica Adiestramiento) is organizing the online webinar "Geotechnical and Structural Design of Piles subjected to lateral loads". The webinar will be held on July 27, 2017, from 17.00 (CEST). ICC Colombia will be delivering a training course on deep and shallow foundation design in Quito (27-28 July 2017). ICC Colombia will be delivering a training course on deep and shallow foundation design in Bucaramanga (9 - 11 June 2017). Geoportal is attending the Annual Meeting of Croatian Chamber of Civil Engineers (12. Dani ovlaštenih inženjera građevinarstva) in Opatija from 8th to 10th of June 2017. Stop by their booth and get information about latest Edition of GEO5 geotechnical software. Fine company will be attending “68. Berg- und Hüttenmännische Tag” conference organized by TU Bergakademie Freiberg (7-9 June 2017). ICC Chile will be delivering a training course on deep and shallow foundation design in Santiago this May 26th, 27th and 28th. GEOgrup Insaat, our partner in Turkey, will be participating in the “Road 2 Tunnel Fair” in Ankara (May 24 – 26). Start Consult GmbH, our partner in Austria, will be attending the 32nd Christian Veder Kolloquium at the Graz University of Technology from 20th to 21th April 2017. The Association of Structural Engineers of the Philippines, Inc. (ASEP) – Regional Coordinating Committee Qatar concluded training / workshop held on the 07th and 21st of April 2017 at City Centre Rotana Hotel, Westbay, Doha, Qatar. TotalCAD, our partner in Brazil, will be attending the 23rd international construction and architecture trade show Feicon Batimat in Sao Paulo (4 - 8 April 2017). 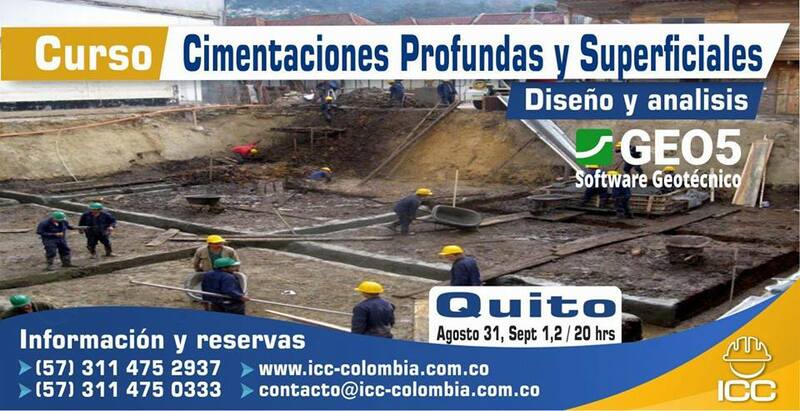 ICC Colombia will be delivering a training course on Foundation Design in Bogotá (31st March - 2nd April). G2 Ingeniería, our partner in Mexico, will be attending the conference 5 Jornada técnica internacional de pavimentos in Querétaro (28 - 30 March). The short marketing and technical course on GEO5 was conducted by Mr. Gouw (GTL Geotech Services) in Jakarta, Indonesia (23 March, 2017). Nanjing Kulun Software Technology Co. Ltd., our Chinese partner, organized training course for using GEO5 programs. Start Consult GmbH, our partner in Germany, attends the conference HEUREKA'17 in Stuttgart (22 - 23 March 2017). G2 Ingeniería, our partner in Mexico, is organizing one day seminar on Slope Stability Design using GEO5 software (16th March, 2017). We were at Geotechnical Frontiers 2017 in Orlando, Florida - together with Gintegro, our exclusive US distributor, and Redi-Rock Inc., our technology partner. CEIM-PERU, our partner in Peru, will organize a seminar about GEO5 in Cusco on 11th March. MMGEO, our distributor in Poland, will present the GEO5 software on the "XXXII Ogólnopolskie Warsztaty Pracy Projektanta Konstrukcji" in Wisla, Poland (7 - 10 March 2017). Fine and Intelligent BIM Solutions, our partner in Latvia, will present GEO5 software in Riga on 23rd February. Fine and Intelligent BIM Solutions, our partner in Lithuania, will present GEO5 software in Vilnius on 22nd February. Civisoft, our partner in Algeria, organized training of GEO5 2017 for SEROR company in Tlemcen (Algeria) from 19 to 24 February 2017. The purpose of this training is to present the new GEO5 2017 enhancements, and apply the tutorials of the GEO5 software. Start Consult EOOD, our partner in Germany, attended the geotechnical conference 11. Tiefbaufachtagung in Dresden from 8th to 9th February. Start Consult EOOD, our partner in Germany, attended the 14th Geotechnical seminar in Biberbach University on Wednesday 18th January 2017. Fine and Oitec Ltda., our partner in Chile, will be attending “IX Chilean Congress in Geotechnical Engineering” in Valdivia, Chile (5 - 7 December 2016). Fine company is attending the "23rd Concrete Days 2016" conference in Litomysl (30rd November – 1st December). ICC Chile will be delivering a training course on retaining walls and gabions in Santiago this November 25th, 26th and 27th. Vietnam Investment Consulting and Construction Designing JSC, our distributor in Vietnam, will be attending the “GEOTEC HANOI 2016” conference. The newest GEO5 software in Vietnamese language version will be presented. The conference will be held on 24th and 25th November 2016 in JW Marriott Hotel in Hanoi. Fine will be attending XXVIII Geotechnical Engineering Conference (XXVIII Reunión Nacional de Ingeniería Geotécnica) this year in Mérida, Yucatán (23-26 November 2016). Stop by booth 33 and say hello! Techgrade Consulting, our partner in Nigeria, will be attending “National Engineering Conference” in Uyo, Nigeria (21 - 25 November 2016). ICC, our dealer in Colombia, will be delivering a training course on Shallow Foundation Design in Quito this November 19th and 20th. Start Consult EOOD, our partner in Germany, will be attending the 4th edition of GEC Geotechnics. The event will be held at the Exhibition Center Offenburg in Germany (16th - 17th November 2016). Fine company supported the 44th Foundation Engineering Conference in Brno, Czech Republic (14-15 November 2016) as the main sponsor. Also the winners of the eight edition of the Student Competition, which is organized together with Mott MacDonald company, were revealed. The winner of the competition in the category of "diploma thesis" is Ing. Tomáš Philipp (ČVUT Praha) for his work "Application of jet grouting for foundation engineering". The winner of the competition in the category of "bachelor's thesis" is Bc. Tomáš Urbánek (VŠB-TUO) for his work "Variant Methods of Metro Station Realization". Fine will be main sponsor of “44rd Conference Foundations Brno 2016”, which is organized by the Czech Geotechnical Society (14-15 November 2016). Fine will introduce the new Edition of GEO5 geotechnical software. And also announce the results of 10th edition of the Student Competition, which is organized together with Mott MacDonald company. We will introduce a new Edition 2017 of the GEO5 software on 45. Geomechanik-Kolloquium in Freiberg (11th November 2016). ICC Colombia will be delivering a training course on deep and shallow foundation design in Cali this October 29th and 30th. The short course for using GEO5 programs will be performed by Mr. Gouw (GTL Geotech Services) in Jakarta, Indonesia. The course shall be conducted on 19th and 20th October 2016. ICC Chile will be delivering a training course on deep and shallow foundation design in Santiago this October 14th, 15th and 16th. Visit their pages for more information about the event. Geogrup, our dealer in Turkey, will be attending the National Geotechnical Congress “16. Ulusal Zemin Mekaniği ve Geoteknik Mühendisliği Kongresi”. The event is organized by ISSMGE and will be held in Erzurum, Turkey on 13-14 October. Nanjing Kulun Software Technology Co. Ltd., our Chinese partner, will be the main sponsor of the 10th National Geological Congress in Chengdu ( 13th-18th October). Feel free to visit their booth to find out more about improvements in GEO5 software. ICC Colombia, our dealer in Colombia, will attend the "XV Congreso Colombiano de Geotecnia” in Cartagena (October 05-06). Feel free to visit their booth to find out more about improvements in GEO5 software. Fine and Proexrom SRL, our partner in Romania, will support the "XIII National Conference of Geotechnical Engineering" and present the new GEO5 2016 Edition. 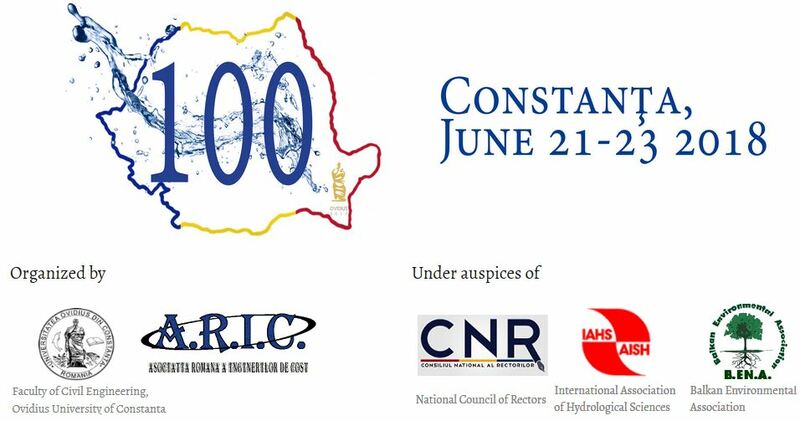 The conference will be held on September 7 to 10 in Cluj-Napoca and is organized by the Romanian Society of Geotechnics and Foundations (SRGF) and hosted by the Technical University of Cluj Napoca. ICC Colombia will be delivering a training course on Slope Stability Design in Bogotá this August 19th, 20th and 21th. Visit their pages for more information about the event. ICC Chile will be delivering a training course on retaining wall design in Santiago this July 8-9.
itech, our partner in France, will exhibit at "Journees Nationales de Geotechnique et de Geologie de L´Ingenieur" conference in Nancy (July 6 - 8, 2016). Join itech to find out more about latest Edition of GEO5 software. 3DR Engineering Software Ltd., Ltd., our dealer in Greece, will be be supporting the “1st International Conference on Natural Hazards and Infrastructure” in Chania, Crete Island, Greece (28-30 June). Join 3DR to find out more about latest Edition of GEO5 software. Start Consult EOOD, our dealer in Bulgaria, is attending the “VII International Conference on Geotechnics”. The Conference will be held from 27 to 1 July 2016 at International House of Scientists "Fr. J. Curie", Varna, Bulgaria. The main organizer of the conference is the Scientific and Technical Union of Mining, Geology and Metallurgy. Join Start Consult at their booth! MMGEO, our distributor in Poland, will be delivering a one day short course on geotechnical design “Projektowanie geotechniczne z wykorzystaniem oprogramowania GEO5” this June 23rd in the city of Warsaw, Poland. The course will be held in Warsaw University of Technology and is prepared in cooperation with Engineering Institute. Infrasys, our dealer in Philippines, will be delivering presentation on the series of seminars "Foundation Solutions for Tomorrow 2016" organized by Mer Lion Metals Pte Ltd.
Mer Lion Metals is a producer of steel sheet piles and also provider of steel foundation solutions on projects in the Asian region. Their MMU and MMZ sheet pile profiles has been implemented to the GEO5 software (released in Spring Update of 2016 Edition). See photos from previous seminars bellow. itech, our partner in France, will promote the newest Edition of geotechnical engineering software GEO5 2016 at Interoute conference in Paris (June 14 - 16, 2016). Our dealer, Geoportal d.o.o., is attending the Annual Meeting of Croatian Chamber of Civil Engineers (11. Dani ovlaštenih inženjera građevinarstva) in Opatija, Croatia on 11th of June. Stop by their booth and get information about latest Edition of GEO5 geotechnical software. We will attend “67. Berg- und Hüttenmännische Tag” conference organized by TU Bergakademie Freiberg (8-10 June 2016). ICC Chile will be delivering a training course on deep and shallow foundation design in Santiago this May 27th, 28th and 29th. Visit their pages for more information about the event. Geogrup, our partner in Turkey, will be participating in the “Road 2 Tunnel Fair” in Ankara (May 26 – 28). ICC, our dealer in Colombia, will be delivering a training course on deep and shallow foundation design in Bogotá this April 29th, 30th and May 01st. Infrasys presented GEO5 Geotechnical Analysis solutions at the Mer Lion Metals "Foundation Solutions for Tomorrow 2016" Seminar held at the Diamond Hotel, Manila, Philippines on Wednesday 20th April, 2016. Infrasys, our partner in Philippines, presents GEO5 Geotechnical Solutions to the DPWH Regional Office XIII and its nine DEO's in Butuan City on Thursday 12th May, 2016. Start Consult EOOD, our partner in Germany, will be attending VDEI-Kolloquium Geotechnik in Neustadt an der Weinstraße (15th March). infraSys, our dealer in Philippines, is organizing one day Seminar|Workshop on Foundation Design & Analysis using Fine Software’s GEO5 software suite and Bentley’s STAAD Foundation Advanced (Tuesday 15th March, 2016). Start Consult EOOD, our partner in Germany, will present GEO5 software at "Erd- und Grundbautagung 2016" in Worms, Germany (8 - 9 March 2016). The short course for using programs Pile and Pile group will be performed by Mr. Gouw (GTL Geotech Services) in Jakarta, Indonesia. The course shall be conducted on 1st to 3rd March, 2016 (in Indonesian language). Infrasys presented GEO5 software on the TransMIT 2016 Conference (18-20 February). SCIA nv performs the online webinars about GEO5 geotechnical software (2/2/2016). The presentation provides with clear overview on the new Edition 2016 and its new features. Take a look at Dutch and French version of the recorded webinars. The short course on the application of GEO5 geotechnical software will be conducted by Mr. Gouw (GTL Geotech Services) in Jakarta, Indonesia (18-20 January, 2016). The course also covers the relevant theoretical background, and determination of required geotechnical parameters. Geogrup, our distributor in Turkey, will present the GEO5 software at "6th National Symposium on Geotechnical Engineering" in Adana, Turkey (25 November 2015). We will attend 22nd Concrete Days 2015 in Litomysl (November 25-26, 2015). Come and visit our booth. Civisoft, our dealer in Algier, will be presenting the new version of GEO5 2016 at the International Fair of the Public works of Algiers. The conference will be held November 18th to 22nd, 2015 in Alger. The Argentinian Geotechnical Engineering Society (SAIG) is pleased to announce that it will be the host of the 15th Pan-American Conference on Soil Mechanics and Geotechnical Engineering (XV PCSMGE), to be held in Buenos Aires (Argentina) from 16th to 18th November 2015 . This conference will bring together international experts, researchers, academics, professionals and geoengineering companies in a unique opportunity to exchange ideas and discuss current and future practices in the areas of soil mechanics and rock mechanics. Fine will be presenting the new version of GEO5 – in the booth number 001. Nanjing Kulun Software Technology Co. Ltd., our Chinese partner, was invited to attend Jiangsu province foundation union annual conference. The conference was held in Dingshan International Hotel in Yixing city and was co-sponsored by foundation professional Jiangsu Province survey and design association and Jiangsu Province survey technology information station. Fine company supported the 43nd Foundation Engineering Conference in Brno, Czech Republic (9-10 November 2015) as the main sponsor. Also the winners of the eight edition of the Student Competition, which is organized together with Mott MacDonald company, were revealed. The winner of the competition in the category of "diploma thesis" is Ing. Zdeněk Šiška (ČVUT - Praha) for his work "Parametric study of slope stability based on monitoring results". The winner of the competition in the category of "bachelor's thesis" is Bc. Martin Baláž (ČVUT - Praha) for his work "Numerical calculations minted metro station Nádraží Veleslavín". Fine will introduce a new version of the GEO5 software on “43rd Conference Foundations Brno 2015”, which is organized by the Czech Geotechnical Society (9-10 November 2015). BHL Projekt d.o.o., our distributor in Serbia, will present GEO5 software at "International Symposium of Geotechnical Engineers" in Vršac, Serbia (2-6 November 2015). This event is organized by the Union of Engineers and Technicians of Serbia and Serbian Society for Soil Mechanics and Geotechnical Engineering. HungaroCAD Informatikai Kft., our dealer in Hungary, will promote GEO5 software on the "Geotechnika 2015. Konferencia" in Ráckeve, Hungary (12-14 October 2015). MMGEO, our exclusive dealer in Poland, will introduce GEO5 software suite at the “17th National Conference on Soil Mechanics and Geotechnical Engineering” organized by the Polish committee of Geotechnics. The exhibition will be held in Łódź, Poland (7-10 July 2015). Mr. Gouw, our dealer in Indonesia, is going to conduct a short geotechnical course during 24-26 June 2015. The course shall cover slope stability analysis, lateral earth pressures and excavation design using the GEO5 software. The course will be conducted by refreshing the basic relevant geotechnical theory, followed by the in depth discussion of geotechnical engineering knowledge and how to implement the knowledge into practice. For further information, please take a look at GTL Geotech Service website. Incotec and Fine companies are excited to invite you to attend the “2nd International Conference on Deep Foundations”. The CEO of Fine, Jiri Laurin, has also accepted the invitation to participate as a speaker on the conference, which will be held in Santa Cruz, Bolivia on 12 - 15 May 2015. The Tunisian Association of Soil Mechanics (ATMS) will organize the 16th African Regional Conference on Soil Mechanics and Geotechnical Engineering. The conference will be held from April 27 to 30, 2015 in Hammamet, Tunisia. Our dealer, iTech (France), will be presenting the GEO5 software during the conference. Free GEO5 Demo (in French or English language) will be available on the booth. Feel free to take a look around. Ingeservicios S.A.C., our dealer in Peru, will attend the "3rd International Conference on Geotechnical and Foundation Engineering" in Lima (April 17-18). Feel free to visit them at the booth 002. JSC Reconstruktsiya participated in the “XII International scientific and practical conference" held at the Moscow State University of Railway Engineering 1-2 April 2015. Our dealer in Indonesia, GTL Geotech Services, conducted the "Pile Foundation Training Course" in February. Nemetschek Scia, our local dealer, is organizing the online webinar about GEO5 software. The presentation (in English) will last approximately one hour and will be held on February 16 at 10h30. 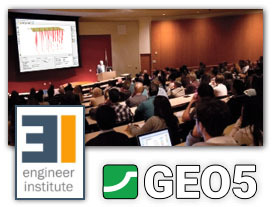 Register to the online session to get a clear overview of GEO5 geotechnical software. During this webinar all the programs will be introduced in an overview and the Slope Stability, Cantilever Wall and FEM programs will be shown more in detail. Our Chinese dealer Pangolin presented GEO5 software in Jiangxi Electric Power Design Institute in February 2015. Geotechnical Department of Technical University of Iasi, toghether with Proexrom, organized the seminar about GEO5 software. The presentation was held in Iasi, Romania in front of teachers, students and geotechnical engineers. During the presentation, answers were given regarding the way the sofware works and its usability. Bulgarian Soil Mechanics and Geotechnical Engineering Society together with Start Consult Ltd. organize the seminar about GEO5 software. The presentation will be held in Sofia, Bulgaria on 5th December 2015. REI Software Co., Ltd., our dealer in Thailand, will be attending the Thailand Engineering Expo 2014 in Bitec Bangna (27-30 November). Visit Mr. Partha Pradhan to get information about our programs and news in v19! Oitec Ltda., our dealer in Chile, attended “VIII Chilean Congress in Geotechnical Engineering” to present their engineering services and also GEO5 geotechnical software suite. The exhibition was held in Santiago, Chile (26 - 28 November 2014). We will attend 21st Concrete Days 2014 in Hradec Králové (November 26-27, 2014). Visit the Fine booth during the conference for a software demonstration of new program FIN EC Concrete Fire. Fine company supported the 42nd Foundation Engineering Conference in Brno, Czech Republic (3-5 November 2014) as the main sponsor. Also the winners of the eight edition of the Student Competition, which is organized together with Mott MacDonald company, were revealed. The winner of the competition in the category of "diploma thesis" is Ing. Václav Pátek (ČVUT - Praha) for his work "Analysis of THM processes for in-situ experiment Mock-Up Josef". The winner of the competition in the category of "bachelor's thesis" is Bc. Tomáš Philipp (ČVUT - Praha) for his work "Foundation of office building in Prague – Karlin". GEOgrup Insaat A.S, our dealer in Turkey, introduced GEO5 geotechnical software suite at “15th National Conference on Soil Mechanics and Foundation Engineering” organized by the Turkish committee of ISSMGE. The exhibition was held in Ankara, Turkey (16-17 October 2014). From 15 to 18 of October 2014, Fine and Ingeosolum Colombia have had the pleasure to being part of the XIV CONGRESO COLOMBIANO DE GEOTECNIA, presenting to the community our software GEO5 to solve geotechnical problems . In a stand that mixed the educational and professional field, GEO5 presented its advantages and solutions for civil and geotechnical engineering. Start Consult, our dealer in Bulgaria, will exhibit at “International conference for development and innovation in Geotechnics and tunneling - GEO PROJECTS 2014" in Sofia (October 15 - 17, 2014). Join Start Consult to see our latest software releases and features in GEO5 software. HungaroCAD Informatikai Kft., our dealer in Hungary, will promote GEO5 software at "Geotechnika 2014 Konferencia" in Ráckeve, Hungary (13-15 October 2014). Fine was pleased to gave a three-day training in National Grid Corporation of the Philippines in Quezon City, Philippines. The workshop consisted of a balanced mixture of lectures and hands-on computer analyses in order to offer an introduction to the modelling of geotechnical problems that are encountered in day-to-day engineering practice. The computer exercises were performed with the latest version of GEO5 software. Wu Wen Yuan, Technical Director from Pangolin presented GEO5 software to the major Chinese design institutes (Railway Siyuan Survey and Design Institute, China Power Engineering Consulting Group South Electric Power Design Institute, Changjiang Water Resources Commission Survey and Design Institute, Institute of Hubei Electric Power Survey and Design Institute) during August 2014. GEOgrup Insaat A.S, our exclusive reseller in Turkey, will be attending “Tunneling Expo Turkey” to present GEO5 geotechnical software suite. The exhibition will be held in Istanbul, Turkey (28-31 August 2014). More than 100 national/international companies will present their products and services at this exhibition. itech, our exclusive reseller in France, will exhibit at "Journees Nationales de Geotechnique et de Geologie de L´Ingenieur" conference in Beauvais (July 8 - 10, 2014). Join itech to find out more about latest news and features in GEO5 software. Start Consult Ltd., was invited by Bulgarian National Organizing Committee to attend the “6th International Geomechanics Conference (IGC'2014)” on June 24-28, 2014 at Bulgaria (Varna). GEO5 Geotechnical software was succesfully demonstrated by our partner. CSP Fea s.c., our dealer in Italy, will exhibit at the “National Congress of Geotechnics” hold by AGI Associazione Geotecnica Italiana. The conference will be held in Baveno, Italy (4-6th of June). GEOgrup Insaat A.S, our exclusive reseller in Turkey, will be attending the “2nd Soil Mechanics and Foundation Engineering Symposium” to present our geotechnical software suite GEO5. The conference will be held in Antalya, Turkey (24-25 April 2014). GEO5 Geotechnical software was demonstrated in the East China Investigation and Design Institute in Hangzhou by Ganzhou Pangolin Technology CO., LTD., our local distributor. Ganzhou Pangolin Technology Co., Ltd., was invited by Engineering Investigation Branch of Architectural Society of China (ASC) to attend the “6th National Slope Engineering Technology Conference (第六届全国边坡工程技术大会)”on April 19-21, 2014 at China (Beijing). Technical Director Wu Wen-Yuan introduced the development history of GEO5 software, new settings of Chinese standards implemented in software and also its wide applications in the field of slope engineering. GEO5 will be presented at "International Construction and Architecture Fair Budma 2014" in Poznań (11 - 14 March, 2014) by MMGEO, our exclusive distributor in Poland. The short course on the application of GEO5 geotechnical software was conducted by Mr. Gouw (GTL Geotech Services) in Jakarta, Indonesia (3-5 March, 2014). Geogrup, our distributor in Turkey, sponsored the "5th National Symposium on Geotechnical Engineering" organized by the Turkish Committee of ISSMGE and Chamber of Civil Engineers-Adana Branch in Adana (5-6 December 2013). "3rd Symposium on Underground Excavations" organized by Turkish Tunneling Society was supported by Geogrup (29-30 November 2013), our distributor in Turkey. Fine introduced GEO5 geotechnical software at the 2nd International Congress of Deep Foundations in Mexico city (November 14-15). During the International Congress "II Simposio internacional de cimentaciones profundas" in Mexico City, Fine introduced to the Mexican market his software GEO5 to solve geotechnical problems, in a stand where interest, exchange of experiences and projects generated a good environment where engineers, teachers, students, private and public companies show particularly interested in our solution. We like to share with our users and customers this experience, and we are looking forward for our next meeting. Fine company supported the 41st Foundation Engineering Conference in Brno, Czech Republic (11-12 November 2013) as the main sponsor. Also the winners of the seventh edition of the Student Competition, which is organized together with Mott MacDonald company, were revealed. The winner of the competition in the category of "diploma thesis" is Ing. Jiří Šach (ČVUT - Praha) for his work "Lining Design of the New Draining Gallery of the Mšeno Dam". The winner of the competition in the category of "bachelor's thesis" is Bc. Zdeněk Šiška (ČVUT - Praha) for his work "Numerical modelling of collector using 2D FEM". GEO5 was promoted by Geogrup on "Syposium on Flood and Land Slide" organized by the Chamber of Civil Engineers-Trabzon branch in Trabzon (24-26 October 2013). HungaroCAD Informatikai Kft., our reseller in Hungary, promoted GEO5 software on the "Geotechnika 2013. Konferencia" in Ráckeve, Hungary (15-16 October 2013). Fine presented its flagship product - Geotechnical software GEO5 - at "18th International Conference on Soil Mechanics and Geotechnical Engineering" in Paris, France (September 2013). The French localization of GEO5 software was introduced to French speaking engineers. But we met many professionals and researchers from both academic institutes and engineering companies around the world. We are glad to receive valuable and positive feedback from the attendees on using GEO5 in their engineering projects. MMGEO, our sole distributor in Poland, presented GEO5 software on the "XXVIII WARSZTATY PRACY PROJEKTANTA KONSTRUKCJI „GEOTECHNIKA”" in Wisla, Poland (5-8 March 2013). Fine company introduced its software products on the "Foundation Engineering Conference" in Brno, Czech Republic (11-12 November 2012). Also the winners of the sixth edition of the Student Competition, which is organized together with Mott MacDonald company, were revealed. The winner of the competition in the category of "diploma thesis" is Ing. Zdeněk Žižka (ČVUT - Praha) for his work "Face stability modelling of shield tunnelling". The winner of the competition in the category of "bachelor's thesis" is Bc. Alice Hastíková (Technical University Ostrava) for her work "Model Analysis of the Interaction of the Geological Environment with a Circular Reinforcement of Underground Works, Depending on the Reinforcement Stiffness". Chinese version of GEO5 was recently presented at the "7th National Excavation congress/ 第七届全国基坑工程研讨会". The conference brought together a select group of 300-400 people including professionals, researchers, and education institutions. Feel free to download Chinese demo version of GEO5 software. GEO5 was presented in the Argentinean congress "Mecánica del suelo e Ingeniería geotécnica " in Rosario, Argentina (12-14 September 2012). Our geotechnical program GEO5 was presented in the Argentinean congress "Mecánica del suelo e Ingeniería geotécnica" organized for the Argentinean society of geotechnical engineering at Rosario's city, from 12th to 14th of September 2012. This event meets the geotechnical community, professionals, researchers, and education institutions, in a environment that promotes debate, exchange of experience, presentations of trends and innovate ideas, in the design and constructions area. Geotechnical software GEO5 has been presented at ANZ 2012(15-18 July 2012) by our Australian distributor, Jones Nicholson Pty. Ltd.
Mr. Michael Corran (Jones Nicholson) met many professionals and researchers from both engineering companies and academic institutes mostly from Australia and New Zealand. The winners of the fifth edition of the Student Competition were revealed on the "Foundation Engineering Conference" in Brno, Czech Republic (8 - 9 November 2011). The winner of the competition in the category of "diploma thesis" is Ing. Jan Vrbata (ČVUT - Praha) for his work "Back analysis of measured displacement of primary lining of Brusnice tunnel". The winner of the competition in the category of "bachelor's thesis" is Bc. Jiří Šach (ČVUT - Praha) for his work "Design of the Primary Lining of a Double-Track Metro Tunnel". Competition is organized together with Mott MacDonald company. Geotechnical software GEO5 was presented at "International conference on Geotechnics for sustainable development" in Hanoi, Vietnam (October 2011). We met many professionals and researchers from both academic institutes and engineering companies especially from Vietnam. In addition, we were glad to receive valuable and positive feedback from the attendees on using GEO5 in their engineering projects. Fine company supported the 38th Foundation Engineering Conference in Brno, Czech Republic (8-10 November 2010) as the main sponsor. Also the winners of the Student Competition, which is organized together with Mott MacDonald company, were revealed. The winner of the competition in the category of "diploma thesis" is Ing. Jaroslav Beňo (ČVUT - Praha) for his work "3D modeling of Blanka tunnel excavation". The winner of the competition in the category of "bachelor's thesis" is Bc. Alice Wetterová (VUT - Brno) for her work "Královopolské Tunnels Brno – securing of the foundation pit". Danube-European Conference Geotechnical software GEO5 with support of Eurocode 7 will be presented at Danube-European Conference in Bratislava, Slovakia (June 2nd – 4th 2010).Come visit us! Geotechnical software GEO5 will be presented at GeoFlorida 2010 (February 20-24, 2010) by our exclusive North American distributor, gINT Software Inc.
Geotechnical software GEO5 will be presented at EngGeo - 2009 in Kiev, Ukraine (May, 12 – 13, 2009). Come visit us! Geotechnical software GEO5 was presented at Tunnel Congress & 34th ITA General Assembly "Underground Facilities for Better Environment & Safety" in Agra, India (September 22nd – 27th 2008). Geotechnical software GEO5 was presented at IABSE Conference on Information and Communication Technology (ICT) for Bridges, Buildings and Construction Practice" in Helsinki, Finland (June 4th-6th, 2008). Geotechnical software GEO5 was succesfully presented at XIV European Conference on soil mechanics and geotechnical engineering, "Geotechnical Engineering in Urban Environments" in Madrid, Spain. Fine company introduced its software products on the "ITA-AITES World Tunnel Congress 2007" in Prague, Czech Republic (May 5 – 10, 2007). We are pleased to announce that GEO5 2019 is now on general release. This release includes major developments to the Stratigraphy program, site investigation Logs and Cross Sections modules, the BIM functionality and the ability to display structure and/or site locations in Google Maps. We now offer six standard packages, each package is comprised of several programs, at very attractive prices together with discounted annual maintenance and lease plans. Get more information about new Edition 2019. New release brings the BIM functionality (Export to both IFC and LandXML formats) and other improvements. Learn more about our Spring update or try the Demo version. Fine Maintenance subscribers and FIN EC 2018 users can download and install the Spring Update for free. Other users can calculate the price of the Single Upgrade in our Shop - just log into your account. Site Investigation module release is postponed to November 2018, as we want to support all requested functions in the required quality. As our apologize Stratigraphy users will receive 2019 version for free. Fine Maintenance subscribers and GEO5 2018 users can download and install the Spring Update for free. Other users can calculate the price of the Single Upgrade in our Shop - just log into your account. The GEO5 software has been localized to Bulgarien language in cooperation with Start Consult EOOD, our Bulgarian partner. Enjoy a wide scale of programs in different language versions for your foreign contracts. GEO5 is currently in 17 languages! The new Edition brings two new programs Stratigraphy and Spread Footing CPT. It also features number of major improvements. Watch a short video about Stratigraphy program for assessment of results from site investigation. Take a look at more information about new GEO5 2018 Edition. Try our Demo Version for yourself. The new Edition brings number of changes and improvements. Take a look at more information about new Edition 2018. The spring update FIN EC 2017 also brings an update of the hardware key content. We advise users with a network key to do this using the Fine License Customer tool before installing the update itself. This process minimalizes possible complications that could occur with network licenses. The update of the key content is necessary even if this procedure was already done before for a GEO5 product. 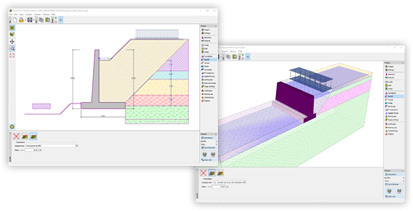 We would also like to introduce our new software package GEO5 Redi-Rock Wall for a complete design of prefabricated retaining walls using the system by Redi-Rock Inc. (USA). 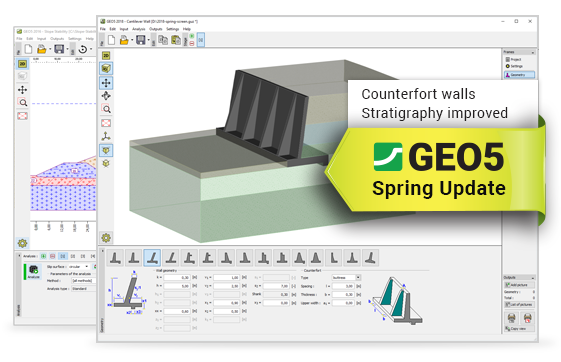 Fine Maintenance subscribers and GEO5 2017 users can download and install the Spring update for free. Other users can calculate the price of a Single Upgrade in our Shop – all you need to do is log in to your account. Simply try our Demo version for free. Fine Maintenance subscribers can download and install the new Edition for free. Other users can calculate the price of the Single Upgrade in our Shop - just log into your account. Subscribe to the Fine Maintenance program and get all upgrades, including new Editions for free. Fine Maintenance subscribers will be offered a special 10% discount on new software or license purchases. GEO5 2017 features many changes and improvements. Simply try our Demo version without any analysis restrictions. Fine Maintenance subscribers can download and install the new Edition for free. Other customers can calculate the price of their Single Upgrade in our Shop – just sign into your account or contact us. Fine Maintenance subscribers can also enjoy the new discount on purchase of new programs or additional licenses of already purchased programs. Our loyal Fine Maintenance subscribers will be awarded with a 10% discount on new software and license purchases! We are introducing a new discount on software and license purchases. The GEO5 geotechnical software suite passed the evaluation process and met all the criteria set by the Ministry of Housing and Urban-Rural Development of the People’s Republic of China (MOHURD). 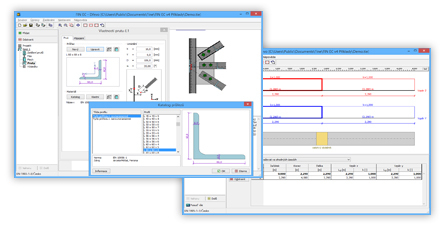 Nanjing Kulun software, our exclusive dealer in China, satisfied the extensive requirements regarding standards, specifications and methods of analysis. A committee of eight experts found GEO5 software suitable to perform geotechnical analyses with credible results based on theory and engineering experience. GEO5 now joins the few civil engineering programs chosen to receive this certification, which is also a testament to the quality of GEO5 solutions and its commitment to the Asian market. Redi-Rock Wall Analysis Software is freeware tool package specifically created for Redi-Rock Inc. (USA) to analyze gravity walls and take full advantage of the multiple solutions provided by Redi-Rock. Existing software users can get the updates by running the "Update GEO5 for Redi" program that was installed with Redi-Rock Wall or simply download the Redi-Rock Wall for Free. Also the verification manuals for GEO5 Redi Rock Wall in metric as well as imperial units has been released. Furthermore, we present new training materials, as well as updated materials for GEO5 2016. Take a look at more information about Spring Update or simply try our Demo Version for yourself. Fine Maintenance subscribers and GEO5 2016 users can download and install the Spring Update for free. Other users can calculate the price of the Single Upgrade in our Shop – just log into your account. Take a look at enhanced list of improvements. Existing users of FIN EC version 5 and Fine Maintenance subscribers can download and install the latest improvements for free. Other users can calculate the price of their Single Upgrade in our Shop – just sign into your account or contact us. Take a look at more information about GEO5 2016 or simply try our Demo Version for yourself. Fine Software changes the method of new releases, as of November 1st 2015. The reason for the revision is to provide better services to our customers and mainly faster availability of new program features. Edition - is released once a year on November 1st, and is labeled with the release year behind the software name (GEO5 2016). Each edition must be purchased separately (upgrade costs 20%). Fine Maintenance users get the upgrade free of charge. Version - Each edition can have arbitrary number of versions, which are released during the year. New versions contain fixes, improvements and new program features. All versions are for free to all edition users. GEO5 2016 comes with many important improvements and changes. GEO5 geotechnical software, developed by Fine s.r.o., recently won the “Top Builder 2014” prize in Poland. Builder, the well-known Polish building magazine, is each year the organizer of the award. The winners were announced during "BUDMA 2014", the international construction fair. Monika Mitew-Czajewska (MMGEO), our exclusive reseller in Poland, received the prize “Top Builder 2014” for GEO5 software. Fine is proud and delighted to announce that we have entered a new co-operation to strengthen our global service and sales vision. For China Fine has teamed up with a first class sales & support agent, Ganzhou Pangolin Technology CO., LTD. Both companies found that the match and synergy for servicing the Chinese market is extremely promising. Fine, Czech company recognized the world over as a leading developer of geotechnical software products. Fine products are now used by more than three thousands of engineers throughout the world in more than 90 countries. Ganzhou Pangolin Technology, having extensive experience in the region, will always be able to support Chinese standards and approaches with the confident local touch. We have therefore signed up an agreement granting Ganzhou Pangolin Technology the exclusive service and sales rights for GEO5 software in China. We are confident that this move will lead to an even higher standard of service to our clients in China. Please visit the new Chinese web site for more information on our partner and our product information in Chinese language. Fine introduced GEO5 geotechnical software at the 2th International Congress of Deep Foundations in Mexico city (November 14-15). We are pleased to announce the release of new program FIN EC Corbel. Program is used for check of RC corbel using strut-and-tie models. 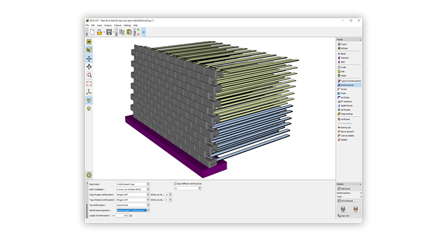 Corbel is part of FIN EC software suite – easy to use tool for design and analysis of 2D and 3D frame structures according to Eurocodes. Also we are releasing update of version 3, which brings further improvements within FIN EC programs. Users of actual version 3 and Fine Maintenance subscribers can take advantage of immediate update for free. The other GEO5 users can get the latest version by purchasing Single Upgrade. Single upgrade from v2 to v3 = 10% of price of all license. Price of Single Upgrade from older versions can be easily obtained in our e-shop – sign in to your account. Please know that this is last chance to upgrade from FIN10 to FIN EC. Limited offer - 30% discount applies till 31.12.2013. 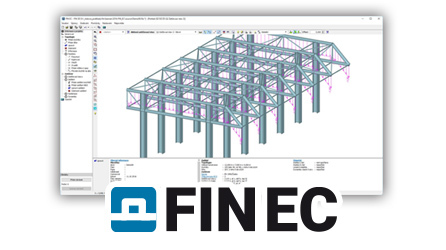 Download and try FIN EC demo version for yourself! Follow us in social media - By becoming a fan on Facebook you can make sure that you hear the latest things first. We are pleased to announce the release of GEO5 version 17, which brings LRFD 2012 standards, Spread footing uplift check, Bustamante methods in Micropile and many other features and enhancements within GEO5 programs. We are also releasing two new parts of Engineering manuals, where first part is focused on Pile analysis and second on Finite element analysis. You can read the full list of improvements. Fine Maintenance subscribers can take advantage of immediate upgrade to GEO5 version 17. Other GEO5 users can get the latest version by purchasing Single Upgrade. Single upgrade from v16 to v17 = 10% of price of all license. Download GEO5 demo v17 – Try our software without any analysis limitations! Follow us in social media - By becoming a fan on Facebook or subscribing to our videos on Youtube, you can make sure that you hear the latest things first. The second part of GEO5 Engineering manuals, focused on the analysis of pile foundations, has been released. The objective of second part is to explain the practical use of programs for the analysis of pile foundations in GEO5. GEO 5 software contains three pile foundation analysis programs – Piles, Pile CPT and Pile Group. The Engineering manuals contains closer explanation of which of the programs is to be used under particular conditions. The great advantage of GEO5 software is the possibility to try more variants and analysis methods, find the most likely behaviour of the pile foundation and subsequently determine the total bearing capacity or settlement of a single pile or a pile group. Explore all possibilities of GEO5 - download Engineering Manual - Part 2 for free. New version of GEO5 has been released with a new system for administration of analysis settings, Pile Group program and many other improvements. We are pleased to announce the release of GEO5 version 15. The most important change in version 15 is the new system for input of analysis settings, which makes the work with programs very comfortable. We also release the long-awaited program Pile Group in version 15. There are also the further modifications and improvements within GEO5 programs. Try new features in the demoversion (v15). Maintenance subscribers can download GEO5 version 15 for free. The other GEO5 users can get the latest version by purchasing Single Upgrade. The new program Pile Group has been released along with GEO5 version 15. Program is used for analysis of group of piles (raft foundation, pile cap). We would like to proudly present the new program - Pile Group. Program is used for analysis of group of piles (raft foundation, pile cap) using both spring method (FEM) and analytical approaches. You can find futher information about Pile Group or download demoversion (v15) to try it for yourself. Or you can check another improvements in GEO5 version 15. New GEO5 version 14 has been released. It brings many improvements like Axisymetry in FEM program, Chinese and Russian Standards (SNIP,GB), Graphical printouts with table of soils. Further info about improvements and new tools in GEO5 version 14. Try new features in the demoversion . Maintenance subscribers can install GEO5 version 14. Fine is pleased to announce their new office has been opened in Rosario – Argentina. Our branch office will support customers throughout Argentina, as well as strengthen the activities already being carried out in Latin America. The new program MSE Wall (GEO5 v13) has been released. It is used to verify mechanically stabilized earth walls. You can find futher information about MSE Wall or download demoversion to try it for yourself. Or you can check another improvements in GEO5 version 13. New GEO5 version 13 (English) has been released. It brings many improvements like modelling of water as a result of water flow analyses (FEM), seismic design (EC8), improved output reports etc. Also the new program MSE Wall for design of mechanically stabilized earth walls has been released along with GEO5 version 13. Further info about improvements and new tools in GEO5 version 13. Existing users may check their license and install latest software. Other users may try demoversion for themselves. We are pleased to introduce a new way of software distribution - online by the new Personalized Setup. New RTF exports for MS Word, program Plate, new methods in program Slope Stability and analysis of consolidation in program Settlement. Further information about GEO5 version 12. JSC Reconstruktsiya, exclusive dealer in Russia, has been going through the application process for the Russian GOST-R Certificate of Conformity. 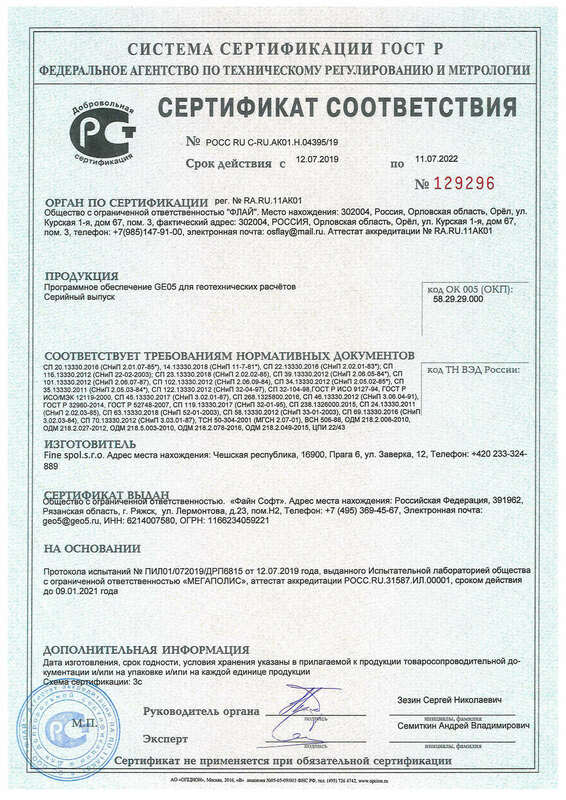 The application process has now been successfully concluded and we are happy to announce that on 3rd of December 2010 the Russian government certified that all GEO5 products are conform to the Russian State Standard. Download and view the full certificate. For more information on this please contact our Russian distributor. Version 11 brings the new program Beam, FEM-Water Flow, new methods in program Piles, National Annexes to EN 1997 and another improvements. Further information about GEO5 version 11. Analysis according to Eurocodes have been fully completed in GEO5 programs. GEO5 Redi Rock Wall program with option "Analyses according to LRFD (Load and Resistance Factor Design)" has been released. New release - GEO5 users with activated program Fine Maintenance can download and install GEO5 version 10. Read the release notes. GEO5 users with activated program Fine Maintenance can download and install upgrade 5.9, which contains number of new features and improvements. Croatian version of GEO5 available! Download the Croatian version of GEO5 demo. GEO5 Demo in other languages is also available. GEO5 - Russian version available! 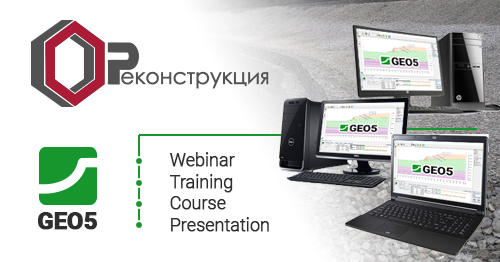 Geotechnical software package GEO5 has been localized to Russian language. Download the Russian version of GEO5 demo. GEO5 Demo is also available in other languages. New GEO5 program Redi Rock Wall for retaining wall design has been developed for Redi Rock Inc., USA. Update all your programs. With one click. What preceeded our worldwide success?